Peterborough United's Jon Taylor in action against Rochdale. Peterborough United manager Darren Ferguson wants his players to go ‘toe-to-toe’ with the top team in League One tonight (February 17). 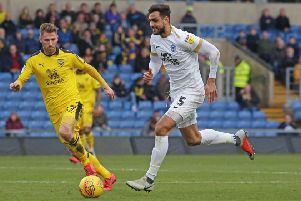 Posh travel to table-topping Bristol City knowing victory could catapult them back into the play-off places. Claiming three points at Ashton Gate, against a City team who have set the pace for the majority of the season, appears a mammoth task. But Ferguson insists it is not an impossible one even though City breezed to a 3-0 success at the ABAX Stadium in the reverse fixture in late November. Ferguson said: “Bristol City are top of the league and been very consistent throughout the season, but we will go there with the belief that we can win the game. “They are the sort of team who can wear opponents down in a game and we have to be prepared to go toe-to-toe with them. “We are fully aware we will have to do certain things well to get a result, but they are things we are capable of doing. “It will be a night where we need to display good composure and look after the ball when we get it. “Everyone knows City were comfortable winners when we met earlier in the season, but I don’t want to reflect on that game too much. We go into this match against them in a better place than we were back in November. Ferguson rates wideman Joe Newell as a major doubt for tonight’s trip after being forced out of a 2-1 home victory against Rochdale last Saturday with a groin problem. Kgosi Ntlhe, who replaced him at the weekend, is likely to deputise. Star man Marcus Maddison also continues to be troubled by the knee problem that led to his early departure in a defeat against Gillingham a week ago. Ferguson must also decide whether or not to hand a starting place to Jon Taylor and David Norris, who both featured as substitutes against Rochdale. Taylor has shown no ill effects after returning from a three-month injury lay-off while new recruit Norris is also fit enough to start despite a lack of action this season while being frozen out at previous club Leeds. “Jon will certainly be involved in some way,” added Ferguson. “It is just a case of deciding if he will have a bigger impact by starting or coming off the bench.